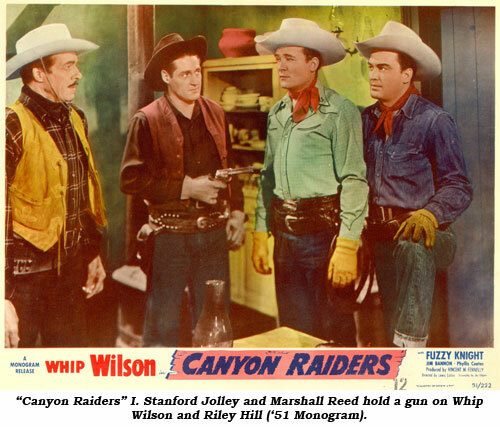 Riley Hill might well be referred to as the “Camille Cowboy” as once his film career ended, he effectively disappeared, apparently preferring to be left alone. Some who knew him attribute his alienation from society to personal problems with alcohol. Little is known of his background, other than he was born Roy Lawrence Harris March 20, 1914, in Fort Worth, Texas. Spotted by a talent scout while Riley was on the stage, his first film role was as a young lieutenant in “The Firefly” (‘37 MGM). 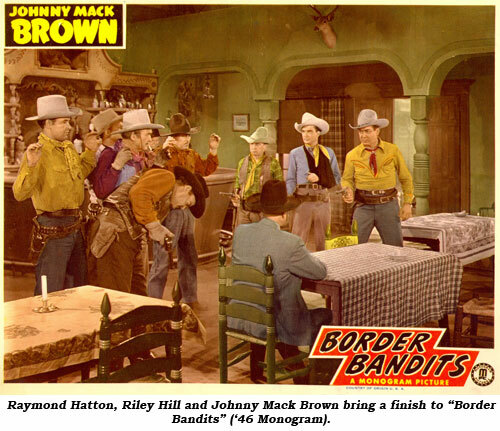 Under contract to Universal as of 1939, his first western was an uncredited role in Johnny Mack Brown’s “Oklahoma Frontier”. It appears Universal was giving him a slow build up, casting him in various types of pictures through mid-‘42 when his career was interrupted by WWII service in the Air Corps. During his Universal period he was billed as Roy Harris with his best roles coming in a pair of Johnny Mack Browns—memorable as the Wolverine Kid in “Law of the Range” (‘41), and “Rawhide Rangers” (‘41). He was off the screen for 1943 and most of 1944 due to military service and returned in late ‘44 for a role in Johnny Mack’s “Ghost Guns” now using the Riley Hill moniker. For the rest of the B-western era he primarily worked at Monogram, often playing the hot headed juvenile lead or heavy. 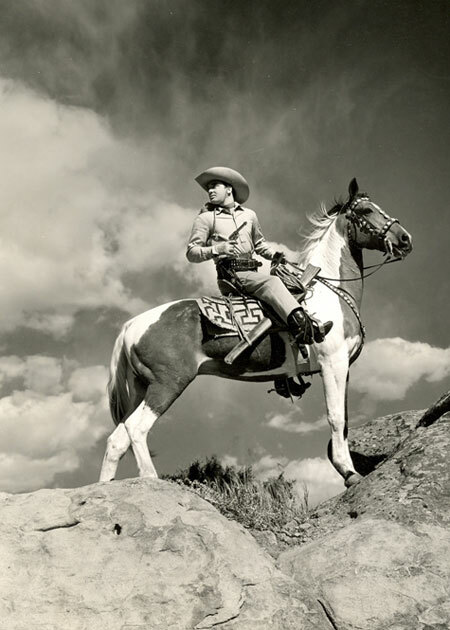 When TV arrived, Hill found plenty of work on “Cisco Kid”, “Lone Ranger”, “Range Rider”, “Wild Bill Hickok”, “Gene Autry”, “Roy Rogers” and other B-western styled TVers. 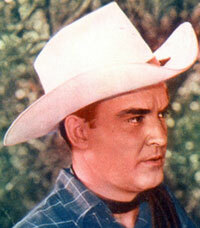 After Eddie Dean left the “live” series, Hill was briefly the lead on ABC’s “Marshal of Gunsight Pass” in 1950. 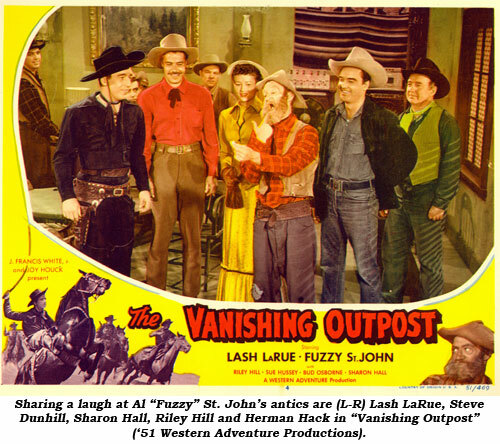 However, he found only sporadic bit parts in big budget titles like “The Lusty Men” (‘52), “The Raiders” (‘52), “Kansas Pacific” (‘53) and “Rio Bravo” (‘59). He did obtain a recurring role in ‘58-‘59 as a trooper on ZIV TV’s “Mackenzie’s Raiders” with Richard Carlson. Hill apparently continued to live in the Tucson area for several years and appeared in small roles in movies made in Arizona such as “Deadly Companions” (‘61), “El Dorado” (‘67), “Trial of Billy Jack” (‘74), “Last Hard Men” (‘76), “Wanda Nevada” (‘79) and other straight-to-video lowbudgeters on into the ‘80s. By this time he was nearly unrecognizable, having gained considerable weight.